Time gives and takes. It adds and subtracts. It creates things that didn’t exist and extinguishes things that did. So as a general rule I distrust history. 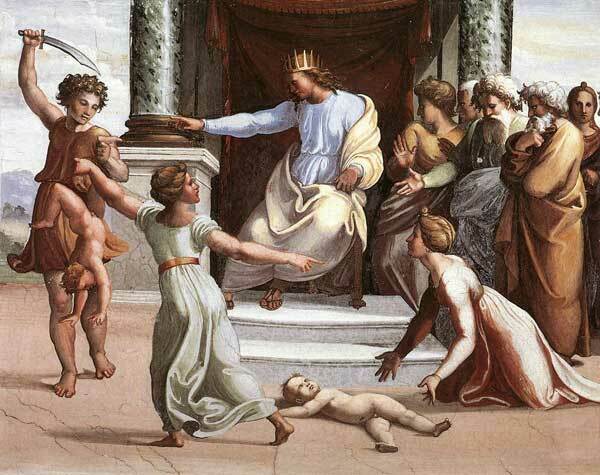 Take for example the story of King Solomon and the baby. Why would a respected wise man mediate a custody case by offering to executive the child? Who would recognize this as rational? And why would any woman – mother or not –agree to it? The story doesn’t ring true. I sense something was lost in translation and time. A better story of wisdom comes from the Muslim world. It could be an additive story, but it nevertheless makes more sense. The shrine at the Kaaba in Mecca existed in pre-Islamic days and even then was considered sacred. It is said to have been built by Abraham. Inside then and now is a rock that fell from heaven. Possibly a meteorite, it is considered a divine gift. A flash flood not uncommon in the Arabian desert destroyed the Kaaba in the seventh century. Leaders of Mecca’s tribes and clans work together and rebuilt it. Along came young Muhammad, future prophet. Being an orphan who had been raised in poverty by Bedouins, he was of low standing among the tribes. But he was also considered neutral. Muhammad was told the problem. He thought about it, then secured a tarp of some sort or a large blanket. He put the stone in the middle and told each clan leader to grasp hold of an edge. Together, they carried the stone into the shrine. True or not, this is a great story of wisdom and mediation. Perhaps more important from the standpoint of story telling, the stone foreshadows the Quran, which Muhammad used to bring divisive, violent, warring Arab tribes together. Quran or no Quran, Bible or no Bible, prophet or no prophet, the absence of conflict doesn’t last long. Today, the Judeo-Christian world tends to think it is at war with the Muslim world. It doesn’t realize the larger war is actually within the Muslim world. As Abraham, Moses and Jesus failed to bring peace, so has Muhammad. Human nature embraces the words of prophets then simultaneously rejects them. It has always been. My interest in learning more about Muhammad and Islam was recently heightened by a well-written work entitled, “The First Muslim: the story of Muhammad.” Author Lesley Hazelton, a journalist and former psychologist, takes a unique and interesting approach to her narrative. Scholars might object, but the most fascinating thing about her book is the way she fills in the historic blanks with rational speculation based on a keen understanding of the human mind. Another appealing feature is the way she has put together all the fascinating stories from Islamic history and culture, ones widely known in the Muslim world but mostly unknown to western Christians and Jews. For the first time I learned that many Islamic rites pre-date Muhammad, including regular pilgrimages to Mecca. I also learned that Arabs considered all scripture sacred and were respectful of all prophets. Furthermore, in a day when little was written down, Jews were honored as “the people of the book.” Christians also had great influence, as the Byzantine Empire moved into the area. Faith and beliefs all seemed to have melded together. That’s enviable. Practices in Arabia had come close to the monotheism of Abraham. The idea of one powerful, all-knowing god was accepted. But in Arabia this god had secondary, sister deities that also were worshipped. Muhammad, in perhaps his most controversial move, wanted the sisters dethroned. His truth, as revealed to him by the angel Gabriel, proclaimed that God was neither begotten nor a begetter; that there were no sister gods. In a way, this is purer than Christianity, with its trinity. Indeed, it was not written down in the prophet’s lifetime. To allow memory to commit large amounts of information, it usually had to be in verse; poetic and alliterative, like a beautiful song. This is the Quran, passed onto the world by a former camel boy. In the process of revelation, where does the human take over from the divine? How much wisdom, intellect and creativity is required of the human? How much did Muhammad have? Was it Gabriel’s truth but Muhammad’s poetry? Or did the angel do it all? If Muhammad had a role, then he was more than a natural poet; he was a self-taught scholar with deep, strong knowledge of the Bible. It is said the Quran was meant to be a continuation or extension of the Bible; that a good portion is biblical tales or re-workings of the tales. Gabriel, of course, would know them. But how did Muhammad? Like the carpenter’s son, he somehow overcame circumstances and acquired a wide and useful education. Maybe it was easier than we think. Without a system of schools and universities, maybe elders were required to pass along great stores of knowledge to the young. Throughout much of his life, Muhammad was an agent and mediator on long caravans up and down the Arabian peninsula. That’s a lot of time for doing nothing more than talking and absorbing. Learning. Another interesting things about Muhammad and the Quranic revelations is they did not come all at once but over a period of more than two decades. When he needed something new, he fasted and mediated and went back up the mountain. Sometimes he had to wait years. Other times inspiration came quickly. It is said by some and disputed by others than on one occasion the verses he brought back were wrong and had to be recanted. It is alleged that he had been spoken to not by Gabriel but by the devil. These are the so-called Satanic Verses, which for a brief time are said to have re-legitimized the three sister gods. After I finish with “The First Muslim,” I’m going to read a translation of the Quran. I’m certain to be surprised, and that what I read will be a departure from what I think I know or have heard. Although purists believe Muhammad’s messages should not be read or spoken in any language other than Arabic, that seems to be changing. I received my English copy from two guys handing them out at the mall, a gift from whyislam.org. My book was published in Istanbul and translated by Abdullah Yusuf Ali. If we can get by the hate, the misunderstanding and the ignorance, there is much worthy to be learned about this culture. Please listen to Ms. Hazelton speak on the Quran.